Joseph Moore was born in Darsham, Suffolk in 1909; he was the son of Robert John and Bessie Moore. The family moved to Sudbury when he was a small boy and he attended North Street School. Joseph had 2 brothers and 3 sisters and the family lived at 1 Gardenside, Croft Road, Sudbury. His father was employed on the railway. Joseph served in the Royal Navy for 7 years, after which in 1933 he joined the police force. 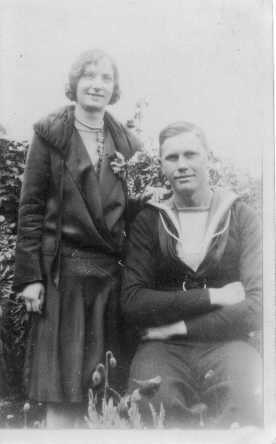 He married Dorothy Bird of Church Road, Great Cornard on 1st September 1934 at St. Andrew’s Church, Great Cornard. They lived in the police house at Ixworth until the outbreak of war when he was recalled to the Royal Navy. His wife and 2 children had to leave the police house and returned to Great Cornard to live with her parents George and Francis Bird in Church Road. Joseph sailed on Christmas Day 1939, the last time his family would see him. HMS Chakdina was torpedoed and sunk just off of Tobruk on 5th December 1941. Joseph has no known grave and he is remembered on the Chatham Naval Memorial, Chatham, Kent. Joseph is also remembered on the Sudbury and Ixworth War Memorials and on a special plaque situated in Bury St. Edmunds Police Station which remembers all the Suffolk police officers who died in the Second World War. His brother Robert James Moore lost his life serving as a Lance Corporal with the 4th Battalion Suffolk Regiment, he was taken prisoner in the Far East and later died on 8th November 1943 aged 26. He lies buried in Chungkai War Cemetery and is remembered on the Sudbury War Memorial.